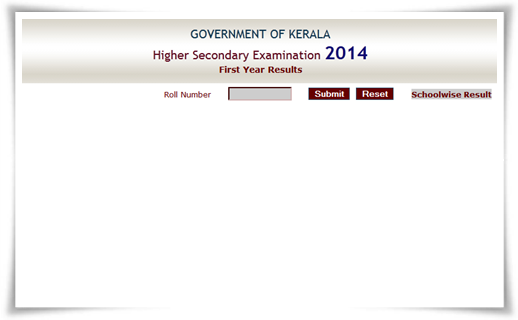 The Directorate of Higher Secondary Education (DHSE) Kerala has published the result of the plus one first year examination held in March on 18th June 2014. Students who had appeared for the first year exam can check their results through the official websites of the education department. Along with the individual result, the school wise result can also be known. The valuation camp was concluded a week ago while the final tabulation was done in two days time. The results were finalized after adding the CE marks to the marks scored in the written exam. Students who are seeking revaluation and those who wish to get the photocopies of the answers sheets should have to submit the application form for the relevant purpose after remitting the fee before 30th June to the school principal where he/she had appeared for the exam in March 2014. The application forms will be made available in the schools and also at DHSE portal. The Directorate of Higher Secondary Education would be conducting the Plus One improvement exam 2014 on convenient dates. The supplementary/improvement examination of the previous year was held in September. As the DHSE mostly notify the results of various examinations through ist online portal, students need to know the password which could serve as the channel to know more. During the results announcement, student can check their individual results by giving their roll number and pass words. But to get the school wise results, the school code should be entered. As each school has different codes, it would be a difficult task to know the code of a particular school. To ease this process, the higher secondary education department has uploaded the school codes of 14 districts in Kerala along with those of Arabian Gulf, Lakshadweep and Mahe. The school codes of each district are given separately in the DHSE Kerala website, but during the peak time, it would be difficult to access the website leaving the students in dark. To help the students, we have combined the complete list of schools in Kerala along with School coded in PDF format. These School Codes can be used to get the results of Kerala SSLC, HSE, VHSE and other exams. Students can download the PDF and can find the code the particular school from the list. The code can be entered in the website to know the complete exam result of the school.